Product prices and availability are accurate as of 2019-04-22 13:56:30 UTC and are subject to change. Any price and availability information displayed on http://www.amazon.com/ at the time of purchase will apply to the purchase of this product. 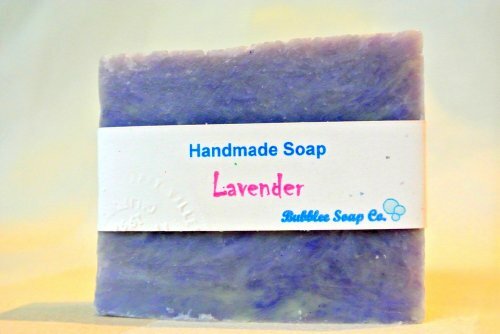 We are currently selling the sought after All Natural Handmade Soap Gift Set - Lavender, Lavender w/ Flowers, Lavender Lemongrass Castile - with All Natural/Organic Ingredients at a brilliant price. 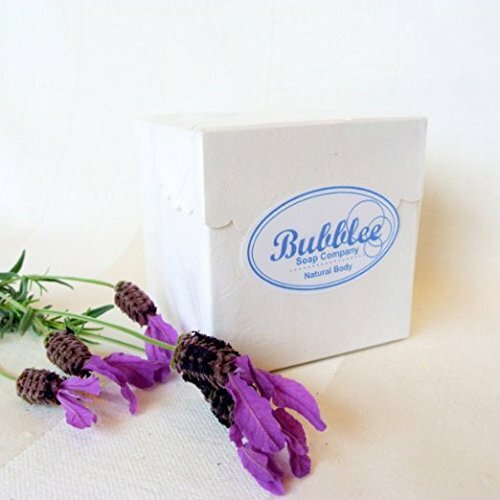 Don't pass it over - buy the All Natural Handmade Soap Gift Set - Lavender, Lavender w/ Flowers, Lavender Lemongrass Castile - with All Natural/Organic Ingredients here today! A wonderful gift for any occasion for mom, teachers or friends!! Packaged in a beautiful embossed gift box, these old-fashioned handcrafted natural soaps are created in small batches using high quality natural/organic oils, butters, herbs and essential oils. Each Soap is uniquely formulated and smells amazing! * Lavender Soap (All Natural): Olive Oil, Water, Coconut Oil, Sodium Hydroxide, Organic Palm Oil, Organic Sunflower Oil, Shea Butter, Lavender Essential Oil, Ultramarine Pigment. 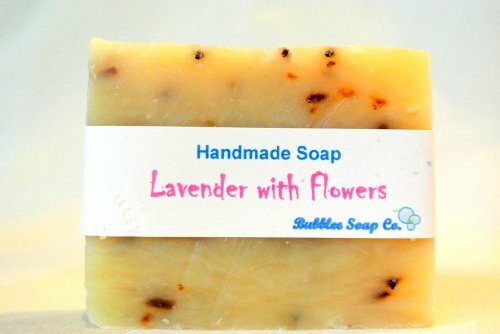 * Lavender w/ Flowers Soap (All Natural): Olive Oil, Water, Coconut Oil, Sodium Hydroxide, Organic Palm Oil, Organic Sunflower Oil, Shea Butter, Lavender Essential Oil, Lavender Buds, Lavender Powder. 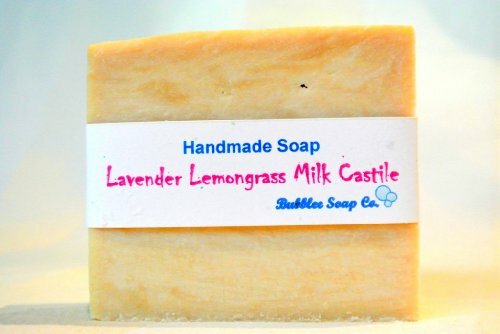 * Lavender and Lemongrass Castile Goat Milk Soap (All Natural, 100% Olive Oil): Olive Oil, Water, Sodium Hydroxide, Fresh Goat Milk, and Lavender Essential Oil, Lemongrass Essential Oil. Note: All bars are between 4 - 5 ounces. Size varies due to the handmade nature of each bar. 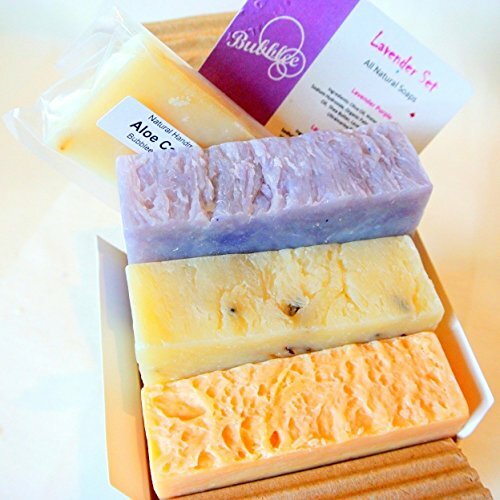 Gift box & sample guest soap varies based on availability. Luxury all natural soaps. 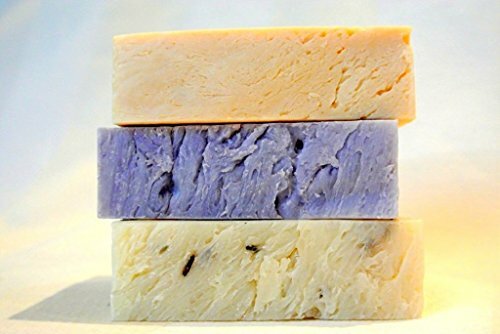 Three 4.5 oz bars (each measuring approx 3.25"x1"x2.5") + free guest soap. Beautiful embossed gift box & ready to give or just pamper yourself! Calm and smoothing. Delightful lavender scent. Made in the USA. Eco-Friendly. No GMO, parabens, sodium lauryl sulfate. Handcrafted with finest natural/organic vegetable based ingredients. Great gift for Birthday, Mother's Day, Father's Day, Valentine's Day, Holiday, House Warming Party, Moving Party, Girls Party, Back to School, Etc.